Cardiovascular disease and stroke prevention by early intervention is of great importance, as heart disease and stroke are leading causes of death and disability in the U.S. Atherosclerosis, often referred to as hardening of the arteries, is a progressive chronic inflammatory disease that damages arterial walls, and results in dysfunctional, stiff, clogged arteries, and improperly regulated blood flow and pressure. Soft, flexible healthy arteries consist of multilayered walls capable of constricting or dilating as needed by the tissues they supply. The loss of artery suppleness and elasticity occurs slowly over time, as plaque formations consisting of fat, cholesterol, calcium, cellular waste and clotting factors, eventually occlude and restrict the flow of oxygen and nutrient-rich blood to all parts of the body. Arterial stiffness, or the loss of vascular elasticity, structure, and function, has been identified as a contributing factor in hypertension, heart attack, stroke, and type II diabetes, as well as liver, kidney and neurodegenerative disorders. Perhaps most importantly, arterial stiffness results in a steady rise in blood pressure, contributing to a vicious cycle of further destruction and loss of flexibility. While aging is certainly a factor, early stages of atherosclerosis may actually begin in childhood, making preventive measures desirable for all ages. A seven-year investigation of cardiovascular risk factors performed by scientists from 15 medical centers found that young persons, males in particular, had evidence of coronary artery disease as early as their mid-teens. The study showed that those who were overweight, smoked, and had the highest blood pressure, blood sugar and LDL cholesterol levels were most at risk for atherosclerosis and heart disease. The now famous and oft quoted Framingham Heart Study evaluated the impact of high total cholesterol, low HDL (good) cholesterol, high blood pressure, diabetes, obesity and smoking on cardiac health. Those who were free of all risk factors had only a 5% risk of developing cardiovascular disease by age 95. Contrarily, those with two or more risk factors had a 69% risk, leading one to conclude that healthful behaviors beginning at a young age can go a long way in preventing future heart disease and stroke. One of the main contributors to loss of arterial stiffness is calcification, which occurs when serum calcium is deposited into the arterial walls. Scientific evidence suggests that vitamins D3 and K2 play important roles in calcium metabolism and management. Working individually and synergistically, vitamins D3 and K2 help to keep calcium out of arteries and promote proper deposit of calcium into bones, where it aids continuous bone remodeling. Several studies have shown that vitamin D3 supplementation is an important approach to preventing or alleviating cardiovascular disease, particularly in high risk groups such as seniors, diabetics, and those with insufficient sunlight exposure and deficiencies in dietary intake. Vitamin K2 helps to activate osteocalcin, a bone protein, and helps to produce proteins that are needed to move calcium from the bloodstream into bone tissue. Preventing arterial stiffness is essential in the prevention of age-related chronic disorders. While aging and family history of early heart disease are risk factors, the exact cause of atherosclerosis remains unknown. However controllable risk factors can help prevent or delay arterial stiffening. Smoking, chronic inflammation, high serum triglycerides and cholesterol, high blood pressure and high blood sugar, as well as an unhealthy diet, obesity and lack of exercise are known largely controllable risk factors. By working to reduce modifiable risk factors, one can help prevent atherosclerosis, improve general health or arrest the progression of the disease. -Follow a heart and brain healthy, low inflammatory plant-based diet that is low in sodium, added sugars, processed fats, refined grains, processed foods, and allergens. Maintain a healthy body weight to reduce excess pressure on the legs, as well as the risk of developing diabetes. -Arterial stiffness with aging has been shown to be less pronounced in physically active persons. Regular aerobic exercise can help to fight atherosclerosis by lowering blood pressure and controlling weight. Strengthening the thigh and calf muscles by walking, cycling, swimming or stair climbing promotes good circulation and encourages blood flow. -Maintain healthy blood sugar levels to prevent or control diabetes. 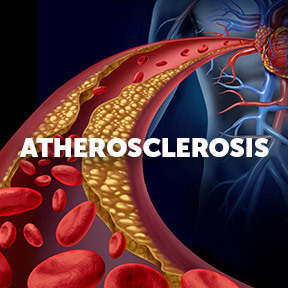 Diabetes can accelerate the progression of atherosclerosis. -Take short frequent breaks from prolonged sitting or standing which can worsen symptoms. A short walk can help to stimulate circulation. While sitting, perform ankle exercises such as pointing, flexing, and circling the feet to activate the calf muscles. -Elevate your legs above your heart for 10-15 minutes daily to help reduce blood pooling and pressure on the legs. -Graduated compression stockings can help with swelling of the lower extremities that often accompanies venous insufficiency. Compression stockings reduce pooling and pressure and may also reduce the risk of forming a deep vein blood clot. Arterial Therapy™ by Integrative Therapeutics®: This triple action blend provides three clinically studied synergistic ingredients, garlic extract, pomegranate fruit extract, and vitamin K2, in bioavailable forms to promote optimal arterial function. Gluten, wheat, dairy and sugar free, vegan formulation. Vitamin D Supreme with Vitamin K1 and K2 by Designs for Health®: This synergistic product supplies a clinically useful dose of vitamin D3 and highly bioavailable forms of vitamins K1 and K2 in support of optimal bone, arterial and immune health. Non-GMO formulation. Nutrient 950® with Vitamin K by Pure Encapsulations®: This hypoallergenic, nutrient rich, highly bioavailable multivitamin/mineral/trace element formula includes superior mineral cofactors, and antioxidants, as well as the active forms of vitamins K1 and K2 to maintain healthy arterial calcium metabolism and vascular activity. Vitamins D and K provide synergistic support for bone heath and blood vessel function. Gluten free, Non-GMO, vegetarian formulation. Compression Leg Sleeve White by Zensah: Made of durable, comfortable, machine washable fabric, these compression sleeves provide calf support, shin splint relief and decreased fatigue. Three sizes available. Quantum Circulation Support by Quantum Nutrition Labs: This unique, proprietary nutraceutical formula promotes healthy microcirculation of blood to peripheral tissues and provides comprehensive support for circulation and associated nerve, heart and arterial health. Vegan formulation. This entry was posted in Home and tagged Arterial stiffness, Arterial stiffness and stroke: de-stiffening strategy, Arterial Therapy™ by Integrative Therapeutics, Atherosclerosis, cardiovascular disease, Compression Leg Sleeve White by Zensah, Nutrient 950® with Vitamin K by Pure Encapsulations, PGX Daily by Bioclinic Naturals, Professional Supplement Center, Quantum Circulation Support by Quantum Nutrition Labs, Vitamin D Supreme With Vitamin K1 and K2 by Designs for Health™, Vitamins and supplements, www.professionalsupplementcenter.com. Bookmark the permalink.